The Mandarin duck is 17 to 20 inches in length and weighs 1 to 1.3 pounds. This perching duck is certainly one of the most spectacular of the ducks, with elaborate and intricately designed plumage, resembling the American wood duck. The male has a long metallic green crest with a broad white central stripe on the side of the head and crest. In addition, there are orange "whiskers," a red bill, brown eyes, and a pair of very large orange "sail" feathers. Females have gray heads with a white eye-ring, a buff and brown mottled breast, white under-parts, and a greenish-brown upper part coloration. Instead of webbing, these birds have sharp claws, which enable them to perch easily in trees and nest in tree holes. The range of the mandarin duck is from eastern Asia through Korea, eastern China and Japan with winters in south to southeast Asia. 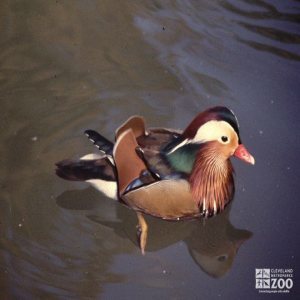 The mandarin duck habitat includes swamps, ponds and lakes in wooded areas. Mandarins are highly social, and flock size can be 100 or more in the winter. Although seasonal, pair bonds are very strong, and these birds will reform old pair bonds rather than establishing new ones. Bonding between a pair takes place on the wintering grounds and during the spring migration. Displays are elaborate and complex on the part of the male. Females take the initiative in choosing mates and often initiate copulatory behavior. Because they live in pairs, faithful to the same partner, the Mandarin duck holds a special place in both Japanese and Chinese folklore as a symbol of conjugal fidelity. Nesting for mandarin ducks usually occurs in tree hollows which are near or overhanging the water. The female incubates the eggs about 80% of the daylight hours and all through the night. Newly hatched young occur from late May until late July. Mandarin ducklings tumble out of their nest after hatching and bounce to the ground or water below with no ill effect. The drop can be as much as 30 ft. Once in the water the ducklings never return to the nest. Males abandon their mates before hatching to undergo their moult, while females moult at a later time.